Hy-vee is one of the grocery chains with over 200 locations in the United States. The grocery store has branches in Iowa, Illinois, Missouri, Nebraska, Minnesota, South Dakota, and Wisconsin. Hy-Vee Ad is browsable on this page whenever it has new deals. Updates will be on your feed if you follow us on Facebook. The product range of Hy-vee consists of many aisles like a deli, dairy, grocery, bakery, frozen food, seafood, meat, fuel service, and more. 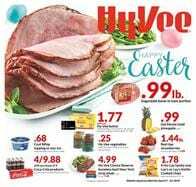 Hundreds of deals are available in the Hy-vee Weekly Ad and you can subscribe to get emails. Some digital coupon deals can be extra savings. Use participating purchases like fuel saver to increase your profit. Moreover, different types of ads like 2-days sale, hot deals, and exclusive ads are usually discounts of Hyvee stores. Hy-Vee also has perks and fuel savers. These will boost the amount you save on everything. Have an account to login to start saving at Hy-Vee. Call them on (800) 772-4098 for questions. Subscribe to Hy-Vee Weekly Ad to get emails of updates.